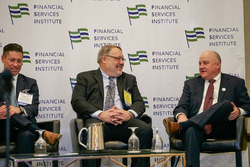 When the Financial Services Institute held its 2018 OneVoice conference in Dallas, Bedford and Main was proud to be a sponsor for fourth consecutive year. Our CEO, John Foster, was especially honored to participate on a panel discussing compliance and supervision issues facing Independent Introducing Brokers. The conference also provided new opportunities to promote Bedford and Main’s expanding securities expert witness and anti-money laundering services, along with various areas of FINRA compliance support. Our CEO - The Good Looking Guy in the Middle!